To read this charmingly antique yet prescient article click here. 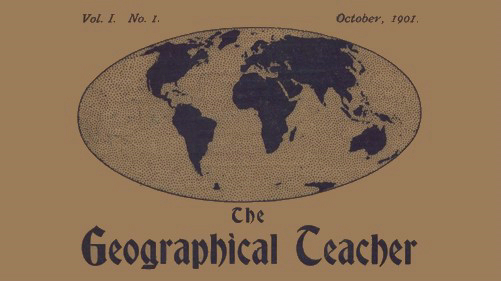 The journal The Geographical Teacher ran from 1901 – 1926. This first article shows the central importance of the visual image, and especially the photograph, in the academic study of geography; a discipline which to this day “rarely receives the recognition it deserves”. It is interesting that Carter here links the emerging middle-class pursuit of photography with another bourgeois device of mobility – the bicycle. The camera and the bicycle would go on to have profound and far reaching impacts on the century that The Geographical Teacher had just begun to publish in. The camera is a geography machine.